Handmade By Michelle features unique, minimalist jewelry in sterling silver, copper and brass. Simple designs are complemented by natural stone and accents of hand sawn designs, enamel and etching. As the sole owner, designer and craftswoman behind the company, Michelle focuses her energy on one-of-a-kind pieces that speak to her vision of the world. Hand soldered and textured metals are blended with natural elements to create unique, modern, minimalist jewelry. Geometric shapes, bold colors and architectural details can be found in the Handmade By Michelle pieces. Michelle seeks to impart the beauty, joy and simple wonder of the world on those around me. 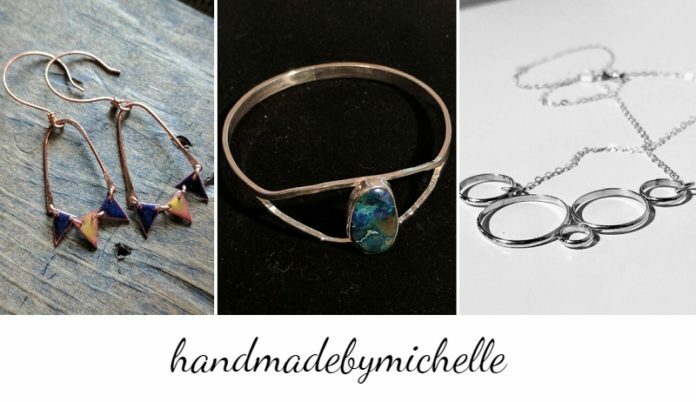 We’re happy to have Handmade By Michelle along with 100+ of Chicago’s finest artisans in food, fashion, home goods + art at the Chicago Artisan Market at Morgan Manufacturing (401 N. Morgan St., Chicago) on Sunday, March 10, 2019 from 10am-4pm. Almost all jewelry can be customized for size. Please contact Michelle with questions about necklace length, earring length or ring/bangle size. To view the Handmade by Michelle pieces, please visit her website.